If you’re a football fan like myself, you’re probably familiar with the famous Jim Mora, “Playoffs? !” rant. It’s a sports meltdown classic. But regardless if you’ve seen it or not, check out this seven seconds clip of the tirade and every time he says the word “playoffs,” I want you to imagine he’s saying the word “soup” instead. That’s kinda the reaction I get every time I tell someone I have soup for breakfast. They think I’m nuts. After all, soup is not exactly a staple breakfast food in America. 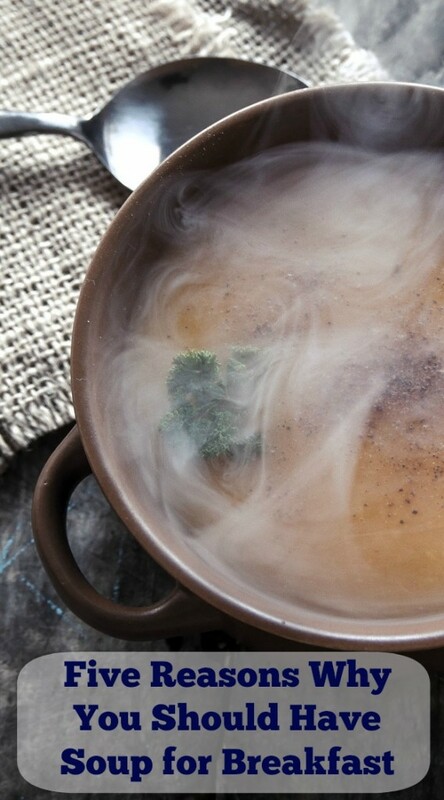 But as I often point out, it is in many other places of the world, especially Asia where steaming cauldrons of soup are a common part of bustling morning markets and street fare. When I was in Burma, I started out every morning with soup for breakfast – namely, a bowl of mohinga, a rice noodle and fish soup (trust me, it tastes better than it sounds) that is most commonly served for breakfast. Ever since then, soups have become a standard part of my breakfast repertoire. One of my challenges as a Nutritional Therapist is getting people to think outside the box for what they can have for each meal of the day. Soup for breakfast certainly fits the bill. This is especially important if we’re removing things like gluten or grains for a while. Because outside of eggs, there’s not a whole lot left, at least in the standard American breakfast landscape of cereals, oatmeal, muffins, croissants, pancakes, waffles, bagels and breakfast sandwiches. If you make a big pot on the weekend, all you need to do is heat it up! This is why I encourage my nutritional therapy clients to get in the habit of regularly making large batches of soup. A simple re-heat is all you need for those rushed morning hours. I hear this all the time: “But I’m not hungry in the morning.” Many people don’t do well with heavier protein-based breakfasts for many reasons. They often skip breakfast as a result but regret it a few hours later when they’re starving at work and have nothing prepared. If you’re one of those people who get nauseous at the thought of eggs and bacon in the morning, consider having soup for breakfast instead (and perhaps reason #5 below). They’re easily digestible and won’t make you feel bloated. Prepared at home from your own stocks, soups are also incredibly nourishing and shouldn’t make you hungry a few hours later either. And if you’re like me and need a bit more protein…. Reason #3 You Should Have Soup for Breakfast: You can still have eggs! Soups don’t have to be light. If you’re one of those people that thrives on heartier breakfasts, soups can still do the trick. Adding a good protein and some starch like rice or rice noodles can make for a very filling meal. And the easiest way to add some quick protein is to add some eggs. They work well in almost any broth-based soup. You can poach ’em right in the soup and they’ll cook in just a few minutes. Add ’em whole or just add the yolks. I’ll often have a miso soup for breakfast and I’ll always throw in a few eggs for a little protein boost. Reason #4 You Should Have Soup for Breakfast: It’s cold outside. As I’m writing this it’s late March here in Massachusetts. It’s 30 degrees outside right now and we have snow in the forecast for tomorrow… ugh. What sounds like a better way to start out your day on a frigidly cold morning? Cold breakfast cereal or hot soup? 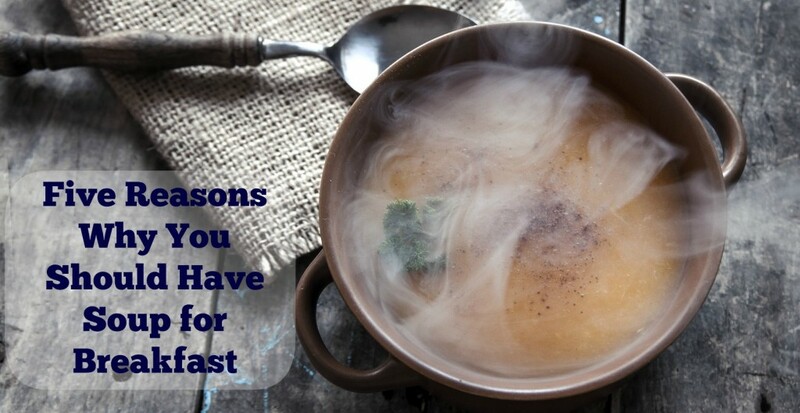 Reasone #5 You Should Have Soup for Breakfast: You have chronic digestive issues. And you when you have chronic digestive issues, whether you realize it or not, you’re probably making things worse with the typical American starchy/sweet breakfast of cereals (including whole grain organic ones), bagels, muffins and god forbid, Pop Tarts. Soups are not just fast, light and warming, they’re also quite healing when prepared in the right way. And that’s why in my new online digestive health program I devote an entire module to making stocks and soups. I’ll show you how to make them from scratch and give you simple recipes for all meals of the day, including of course, breakfast. 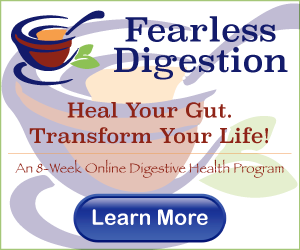 Of course, there’s a lot more to healing digestive issues than homemade soups but it’s certainly an important one as the logo for my new program can attest!